MFI Preaches Message of Love at Croydon Town Centre! 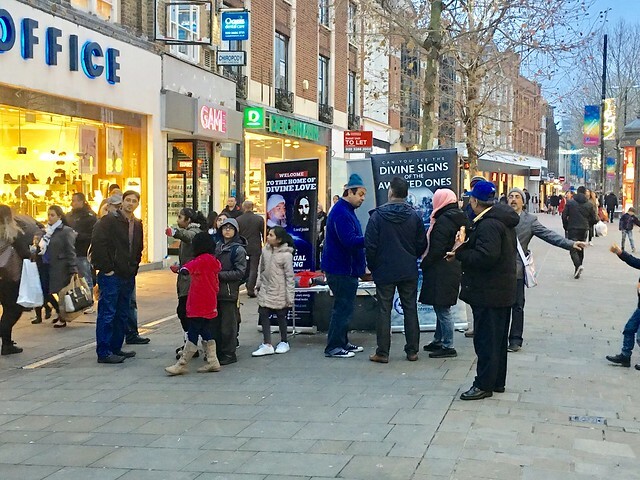 Recently, a delegation from Messiah Foundation UK visited Croydon, one of the largest commercial districts outside of Central London to promulgate the message of Lord Ra Riaz Gohar Shahi to passers-by, residents and tourists. One of the busiest places where the message was accepted on a large scale was in Croydon Town Centre at the Whitgift Shopping Centre. We displayed large banners bearing the images of HDE Lord Ra Riaz Gohar Shahi on the Moon, Sun and Holy Black Stone. People of all religions were attracted to these images and happily approached our team to learn more about our message. We delivered the Goharian Philosophy of Divine Love and explained the methodology of Invocation of the Heart through the image of HDE Lord Ra Riaz Gohar Shahi on the Moon. Our members, on many occasions, were thanked by recipients who were grateful to hear about the arrival of the Awaited One.